PRP has always been one of the best treatment for hair fall with impressive results and benefits of natural growth factors. But, here at Dr. Nivedita Dadu Dermatology Clinic we believe in achieving par excellence results to meet our patients expectations. 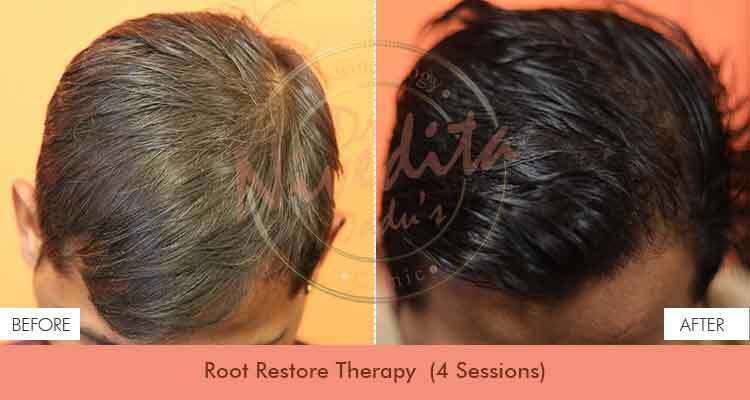 Root Restore Therapy is one such big leap where fusion of technologies is curated in a way to witness magnificent improvement in hair regrowth. A perfect amalgamation of benefits of microneedling with laser and growth factors with platelet rich plasma blends together to work on all the possible causes of hair fall and stimulate the hair regrowth. Treatment is quick, efficacious and virtually painless, thus giving far more potent results than a regular PRP session. Laser therapy uses different wavelengths of lights which stimulates the epidermal stem cells which are responsible for the regeneration of hair follicles. It causes vasodilation and accelerates blood circulation around hair follicle which helps to increase delivery of nutrients and oxygen to the hair follicles making the hair thicker, stronger and healthier. Growth factors when infused in scalp with help of splendid microneedling technology , can reverse back the shrinking of hair follicles. Further they have the ability to repair and heal more quickly. As these stem cells have spectacular regenerative properties, they help in promoting scalp blood vessel growth and activate dermal papilla cells. These growth factors when combined with platelet rich plasma works effectually to reverse the miniaturization of hair follicle to become healthier and larger, producing more robust hair growth. Growth Stimulator will activate follicular progenitor cells and PRP is loaded with growth factors that promote rapid neovascularization and localized cell growth. It is effective for both male and female pattern hair loss. This blend of techniques assures more efficient, faster and majestic results. Dr. Dadu recommends successive sessions of treatment to get long lasting and inspiring results.